I heard so much about this book, I couldn’t wait to read it. I enjoy stories where people need to get past obstacles, and I could relate to Cece’s struggles to make friends. Learning more about the difficulties of being deaf in a hearing world really made me think. 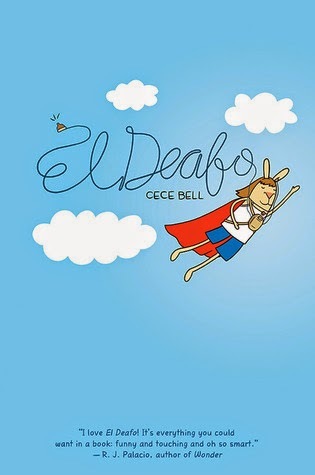 El Deafo by Cece Bell, Amulet Books, New York: 2014. The graphic novel format worked so well for this middle grade autobiography. It was effective to have blank speech bubbles to emphasize what Cece couldn’t hear, as well as changes in the text size and content to emphasize what she did hear. But what really drew me in was the story of Cece’s struggle to find her way in the hearing world. I loved the superhero character she created for herself and her imaginings about different ways things would be if she really did have superpowers. This book is funny and emotional and makes you think. From a writer’s perspective, it was interesting to see how the text and pictures went together to create the story. I loved how the pictures could capture the different settings in Cece’s life, and the emotional expressions. Cece Bell is severely deaf, and El Deafo is based on her own childhood (and the secret nickname she gave herself). She also wrote and illustrated the Geisel Honor book Rabbit & Robot: The Sleepover, as well as Itty Bitty, Bee-Wigged, Food Friends, and the Sock Monkey picture books and many others. She’s married to Tom Angleberger, author of the Origami Yoda books. They live in Virginia, where Cece works in a really cool “barn” next door to their house. To learn more about how your differences can become your superpowers, check out Matthew Winner’s conversation with Cece Bell on the Let’sGet Busy podcast. Fascinating stuff! For more, visit Cece Bell's website. Yay for El Deafo! It just won a Newbery Honor. And -- funny coincidence -- you and I are both featuring it today. Like Joanne said above. Today is full of coincidences! Very good coincidences! Thanks for stopping by! Oh, I didn't realize it won a Newberry Honor. How awesome! It soounds good. I think you'd enjoy it, Natalie! How cool that you featured this on the day the Newberry awards were announced! I can't wait to read this. I just got it from the library, but unfortunately, my son hijacked it. :) It sounds amazing! I really liked it! I hope your son is enjoying it.